Doing some research building a helve hammer. For now I plan on making it foot operated. I think I have have a design I like. I figured there had to be someone around with more experience than me. I was trying to figure up an weight of the hammer head. I know it is as big as I make it. Although there has to be a balance between expended energy and desired effect. What do you think is a reasonable weight I should aim for? I was thinking along the lines of 10-15lbs. The intended use will be for blades and small blacksmithing projects. I dont forsee using stock larger than 1"
I have never seen that picture before. That's a good design other than the treadle to arm connection, on the hammer arm it should be closer to the pivot. 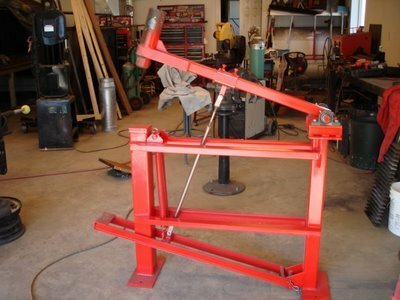 Is the point where the treadle - hammer arm connection connects to the hammer arm adjustable? How are these hammers supposed to work? i dont understand . They're pretty simple. You stomp on the foot pedal and the hammerhead comes down. They have an advantage over hand hammers for some things that would otherwise require three hands, and there are those who use them to do light drawing-out of billets, but they really excel at hot-stamping or cutting. The Clay Spencer designed, IN-LINE TREADLE HAMMER is a bit more complicated but if this is a tool you intend to keep, I think it's worth the extra effort. The main advantage is the hammer and anvil faces are always parrallel reguardless of stock thickness. The plans are for a 65 lb hammer but I think you could scale it for any weight you desired. ABANA has the plans for $15 plus shipping. Does the foot pedal to arm connection move? Or do the foot pedal and hammer arm move in a 1:1 ratio? Karl, look at it. There is clearly pivot pins and pillow block bearings on the end of the hammer arm and foot treadle. so the piece thats on the hammer arm slides? im sorry sam, i have a hard time figuring out pictures from one side. My guess is that it does by the look of those bolts sticking into the sleeve that it seems to be attached to. 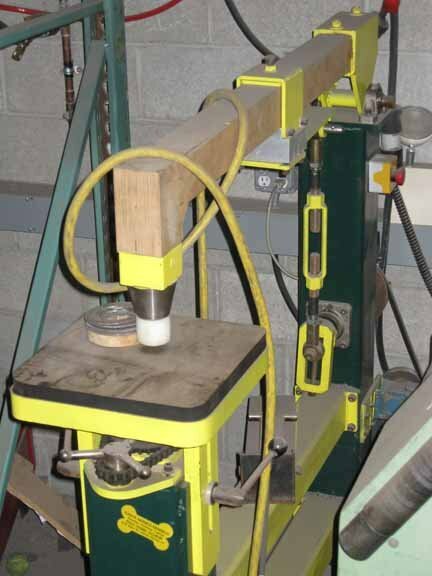 If it is adjustable would the hammer come down faster if the arm connected closer to the pivot point? The connection to the arm is adjustable. But the trade off is the speed and force the hammer is able to achieve. Its a lever just like your arm. Thank you Steve, you did bring up a good point that I had not fully considered. Larger stock would cause the angle of the head to change. In turn it could change the desired effect intended. As you move the peddle to arm connection closer to the pivot you can gain more speed and force but you can loose fine control. As you move the connection to the hammer head closer; you will loose speed and force. Although you gain more fine control. here is a helve i made for sheet metal. I was trying to figure up an weight of the hammer head. I know it is as big as I make it. Although there has to be a balance between expended energy and desired effect. What do you think is a reasonable weight I should aim for? I was thinking along the lines of 10-15lbs. The intended use will be for blades and small blacksmithing projects. I dont forsee using stock larger than 1"
I have to admit, unlike some hammers that look fairly complicated, this one does have the look of being easy to make. Helves are really nice for their simplicity, as long as you don't mind the fact that the hammer head and anvil are only parallel at one particular stock thickness. It's when you try to get truly linear motion that things start to get complicated. I wonder if you could partially -- just partially -- make up for the parallelism problem with interchangeable flat dies (if that's the right term) of slightly different thicknesse that fit either the hammer or the anvil. By changing dies you could change the distance between the hammer and anvil at parallel, which'd let you adjust somewhat for different thicknesses of material. I'm not sure how changing the dies would work, but if you could adjust the hight of the anvil, that would most definitely allow you to keep the face of the hammer parallel with the anvil for different work thickness - I suspect that you would only need a couple of inches of adjustment for most needs. But how to be able to make those adjustments and still keep the design simple is a whole 'nother ball game. That's the idea: the different thicknesses would vary the height of the working surface of the anvil. For forging blades I don't think it would be much of a problem. You could forge in the edge bevels, forge in tapers, forge in the point, in fact I think it would be more suitable than an inline design. i think if you made a guide h-frame from the hammer to the flat, 2 slides, one on the arm and the other on the guide itself, that would make it in-line, right? then just take it off and fix the head for bevels, maybe? i don't really know what i'm talking about, just throwing ideas out there. Casey, yes but the more friction you introduce IE the guides the more efficiency you lose. That and complicating what is a very simple tool, you may as well build a power hammer then. Helves are the ultimate KISS tools.